Celebrated children's author Mike Leonetti returns, with side kick illustrator Greg Banning by his side, for the next installment of his hockey history-themed children's books. This time he's back with The Mighty Tim Horton. This is the latest in long line of hockey history themed children's books by Leonetti. He has the formula down perfectly. The aspiring hockey dreams of our young lead character Trevor are heightened by a chance meeting with his favorite player - Tim Horton of the Leafs. The storyline is inspiring and well done, ready to be enjoyed by your children and yourself as your own hockey memories come back. As always, Banning's illustrations are incredibly realistic and a treat to enjoy on their own. I've never quite understood why kids would want to read a book about a hockey star they've never heard of before. But every kid in Canada knows of Tim Hortons, the iconic coffee and donut shop that is almost as big a piece of Canadiana as hockey itself. This is the perfect opportunity for the next generation to find just who Tim Horton was and how great of a hockey player he was. That, plus the tie in with the Leafs, makes this an obvious inclusion for Leonetti's line of books. I think my biggest question is why wasn't this book written long ago? Interested in this title? 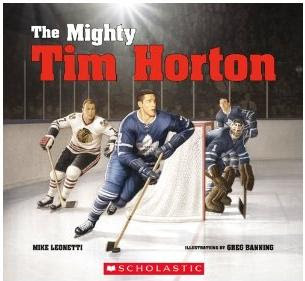 Previous history-themed children's titles by Leonetti include Wendel and The Great One, Maple Leafs A-Z, Gretzky's Game, The Greatest Goal, The Goalie Mask, Number Four, Bobby Orr!, A Hero Named Howe and My Leafs Sweater. Trevor is a defenseman who loves to use his size in his game- sometimes a little too much. He''s taking needless penalties, costing his team the wins they need to advance. He hates letting them down, but he doesn''t know how to change his game. As the Leafs head for the Cup in the 1961-62 season, he follows the plays of his hockey hero- Tim Horton- for inspiration. Horton is a big defenseman too, but he uses his size wisely. One day, through a lucky coincidence, Trevor comes face to face with Tim Horton, and finds the nerve to ask him for some tips. Now, armed with some sound advice, he returns to his hockey team determined to rein in his temper and play a better game. And what a game it is! Trevor helps his team on to victory just as the Leafs hoist their newly won Stanley Cup- with a winning goal assisted by none other than Tim Horton! Scholastic is also offering a free excerpt.